Trees look much smaller outdoors with the sky as the ceiling. Before you leave for a farm, measure your ceiling height accurately. Then subtract the height of your tree top ornament and the height your tree stand raises the tree off the floor. Now you have the height measurements you need. Next measure the width you need. While searching for the "perfect tree", keep in mind that Mother Nature tends to leave the North side of trees less full so that a flat side or two may be helpful fitting a tree closer to a wall or corner eliminating the need to prune at home. 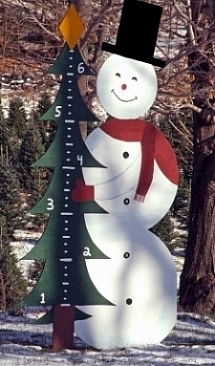 At the farm, measure the tree you intend to purchase to eliminate the need to prune and cut at home. Don't overbuy! The freshest tree you can buy is the one you cut or watch being cut. The next freshest is a locally grown tree. 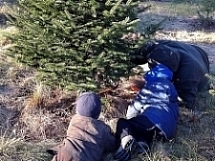 If you purchase a tree at a retail lot, ask where the tree was grown and when it was cut. Most fresh Christmas trees have soft pliable needles that do not snap when bent or come loose when the outer branches are stroked. All conifers (evergreen trees) shed needles from inner branches which often lodge in the interior of the tree. This is a normal part of the life cycle of the tree. This phenomenon occurs because the tree is preparing itself for winter. Many retailers will supply a tree shaking service. The shaking service actually removes the loose dead needles before you take the tree home. Choose a tree supplier that can wrap your tree in netting. A baled tree makes handling and transporting easier. Once home, this compressed package allows mobility in maneuvering within your home.